Some golf, some grow roses. I dabble in my back yard with three wells completed to depths of 13 to 15 feet. Since 1993 when I installed my first well at the "Gulf Coast Groundwater Research Institute" or GCGWRI for short, I have been monitoring groundwater levels in a shallow sand aquifer underlying my back yard. The data collected over the years has spawned a paper, numerous presentations and a geological society field trip. In addition, the data collected from the wells raises no less than a few questions as to what is going on with the data observed. Below are some of the highlights of the data collected. I hope you enjoy looking over it. MW-2 is a 13-foot deep well located at the GCGWRI in mid-town Mobile. The water level in the aquifer responds to precipitation events of 0.75 inches or more with a rise in the aquifer's potentiometric surface, Inset 1. Associated with this rise is a sharp change in direction of groundwater flow. 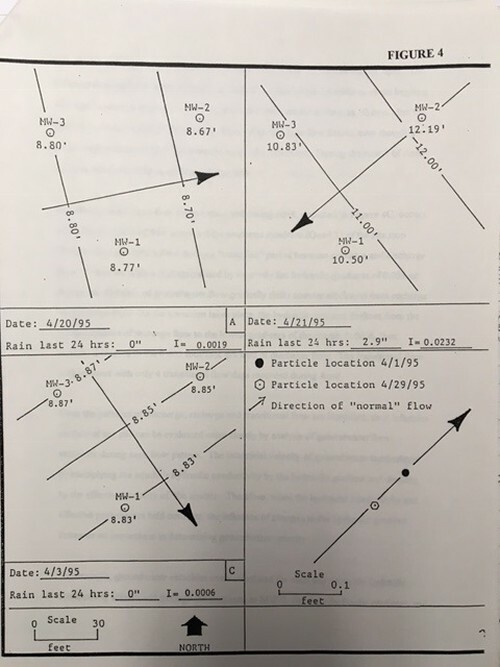 Depending on when a groundwater level survey is conducted, the flow direction can be as much as 180 degrees different, Inset 2. On groundwater contamination projects that depend on knowing the direction of flow, not being aware of these changes can ultimately lead to failed remediation efforts and wasteful spending on monitoring wells improperly placed. OAI's MW-2 Gets a New Logger! On March 27, 2010, the water level data logger in MW-2 was changed out and replaced with a data logger that records water level and water temperature. Data is recorded hourly. During the water year ending September 30, 2010, 93+ inches of precipitation were recorded at this location. Base water level is in the 5.18 to 5.22 foot range as seen in the relatively dry period from June 6 to August 15, 2010. During this dry period, area lawns turned brown and crunchy reflective of the dry conditions. Begining August 30, 2010, abnormally dry conditions returned to the area. Area stream flow data also show the effects of the lack of precipitation and these dry times have been reported in the press. Temperature information provided by the logger shows that shallow groundwater at this location reaches maximum temperature in October and reaches its lowest temperature in March. The high temp, 22.68 degrees Celsius (C) (72.82 F), was recorded at 4PM on October 11, 2011. The low temp, 16.50 C (61.70 F), was recorded at 2PM on March 12, 2010. The water level plot resembles that recorded earlier between 2007 and 2009, Plot posted above, with fluctuations due to significant precipitation events. The plot of the last two year's temperature and water level data is seen below.